Peter Riddell, Ph.D. (1985), Australian National University, is Vice Principal Academic at Melbourne School of Theology and Professorial Research Associate in History at SOAS. He has published widely on Islam in Southeast Asia, including Islam and the Malay-Indonesian World (Hurst, 2001). 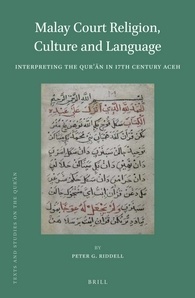 In Malay Court Religion, Culture and Language : Interpreting the Qurʾān in 17th Century Aceh Peter G. Riddell undertakes a detailed study of the two earliest works of Qur’anic exegesis from the Malay-Indonesian world. Riddell explores the 17th century context in the Sultanate of Aceh that produced the two works, and the history of both texts. He argues that political, social and religious factors provide important windows into the content and approaches of both Qur’anic commentaries. He also provides a transliteration of the Jawi Malay text of both commentaries on sūra 18 of the Qur’ān (al-Kahf), as well as an annotated translation into English. This work represents an important contribution to the search for greater understanding of the early Islamic history of the Malay-Indonesian world.